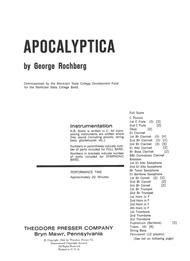 Apocalyptica (Full Score and Parts). Composed by George Rochberg. Concert Band. For Piccolo, Flute I, Flute II, Oboe, Clarinet (in Eb), Clarinet I, Clarinet II, Clarinet III, Eb Alto Clarinet, Bb Bass Clarinet, Bbb Contrabass Clarinet, Bassoon, Alto Saxophone I, Alto Saxophone II, Tenor Saxophone, Baritone Saxophone, Cornet I, Cornet II,. Contemporary. Score and Set of Parts. Standard notation. 56 + pages. Duration 20 minutes. Published by Theodore Presser Company (PR.115400750).With Standard notation. contemporary.